Nicknamed “Piccola Roma” (Little Rome) for its historic importance, and eternally famous as the setting for Romeo and Juliet’s forbidden love, Verona is a city that manages to be both romantic and monumental. A harmonious yet diverse place where still-in-use Roman buildings rub shoulders with lovely Renaissance creations and modern shops and restaurants, Verona is a wonderfully atmospheric city that brings together the best Italy has to offer. No literary fan comes here without passing by the Casa di Giulietta (Juliette’s House), where legend says the heroine lived. Many people come just to touch the Juliette statue in the courtyard; rumor has it that if you rub her bronze breast you will soon get a new lover. Another must-see sight is the Roman amphitheater, dating to the first century. It’s the third-largest Roman amphitheater in the world and now serves as the city’s opera house; the opera season runs from July to September, and seeing a work at this storied place is a real treat. Feuds and strife have been a part of Verona’s history long before Shakespeare was around to make a commentary on it. In 550 BC, the founding Euganei handed over their settlement to the Cenomani, who in turn ceded to the Romans in 300 BC. The city’s convenient location at the crossroads of northeastern Italy and on the banks of the Adige River helped it achieve greater importance in trade. It also made it a prize worth fighting for; and many kingdoms tried their hand at conquering it. The Goths swooped in in 489, followed by the Lombards a century later, and eventually noble families took control, culminating with the long reign of the Della Scala family. As in the rest of Italy, the city declared itself a commune in the 12th century, helped along by the city’s growing wealth and prestige, though before long it was part of the Lombard League. A famous character in Verona’s history is Cangrande I (“Big Dog”), who was a member of the ruling Scaligeri family. Dante was a regular in their court and the final chapter of his “Divine Comedy”- Paradiso- was dedicated to Cangrande. Many of the monuments you see today in Verona date back to the period of his rule. Fast-forward to the 18th century, when the city was occupied by Napoleon, who handed the territory to Austria. Ultimately Verona became part of greater Italy in 1866, when the country was unified. Today, Verona is an elegant and wealthy city that attracts International wine lovers (it is home to Vin Italy, one of the largest and most important wine fairs in the world) and opera lovers (the summer opera season in the Roman amphitheater is absolutely spectacular). The city is a delight to visit, a prosperous and tidy small town that offers fine restaurants, elegant shopping, culture and historic ambience. Whether or not you try daring local dishes like sfilacci, bistecca di cavallo, pastisada and asino (shredded horsemeat, horse steak, slow-cooked horse-meat and donkey, respectively), cuisine in Verona is sure to surprise. The famed horse tradition was probably inherited from the Lombards, who had control of this area from the sixth through eighth centuries, and it’s still apparent on many local menus. Other meaty favorites include bollito misto, a dish of mixed boiled meats served with broth that originated here but later spread throughout Italy. Verona is the largest wine center of the Veneto, which itself is the largest wine-producing region in Italy. Among the wide variety of wines you will find here are fine wines such as Amarone della Valpolicella and the white wines of Soave. As Verona hosts Vin Italy, the restaurants tend to have incredible wine lists. Bottega di Vino and Il Desco both have epic wine lists of both Italian and foreign wines. Verona’s first-century Roman amphitheater is beautiful and remarkably well preserved. “Arena” means sand in Latin, which is a reference to the sand laid in the area where bloody gladiatorial games were played. This ancient Roman arena has been host to Gladiators, Roman circuses, mock battles, equestrian shows, bullfighting, jousts and medieval tournaments. It has served as an outdoor theatre since the 1700’s and today offers lucky visitors a spectacular venue for the summer opera season. The arena seats 25,000 spectators! The first opera was performed here in 1913, and was Verdi’s “Aida”. 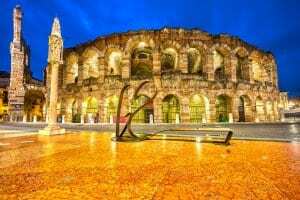 Seeing the opera at the Verona “Arena” is a once in a lifetime experience. This gorgeous 14th century castle has been transformed into an art gallery with a dazzling array of paintings, sculpture, jewelry, swords and coats of arms. Cangrande’s tomb is also here. Long storied to be the house where Shakespeare’s Juliet called out “Where art thou, Romeo?” This balconied house is a popular stop in Verona. Gates that once formed part of the defense wall and stood to protect the city, like the Porta Leoni and Porta Borsari, are dotted around the city. Stately palaces and extremely elegant shops stand watch over this busy square, which is now a tourist magnet filled with colorful market stalls and cafés. The most beautiful Renaissance building in the city, this medieval town hall sits on the peaceful Piazza dei Signori. An opulent palace on the Piazza dei Signori, this was the residence of the Della Scala family, who ruled the city in the 13th and 14th centuries.